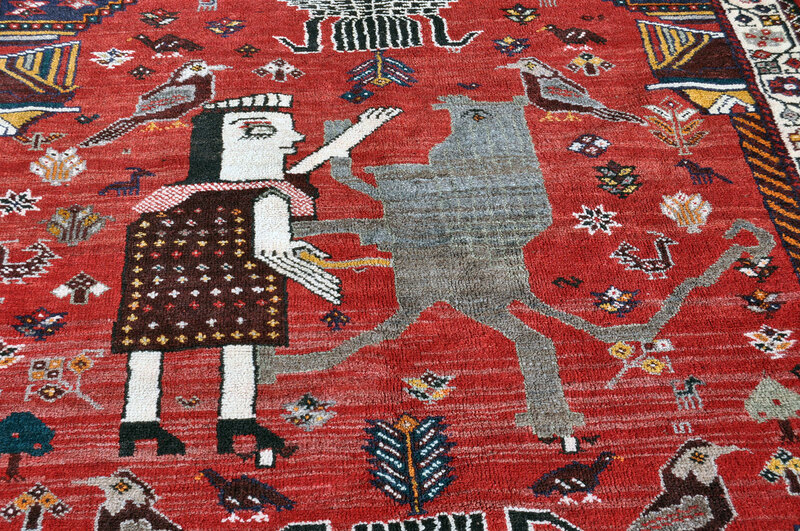 Awesome geometric hooked medallion rug with strange humanoid figures. 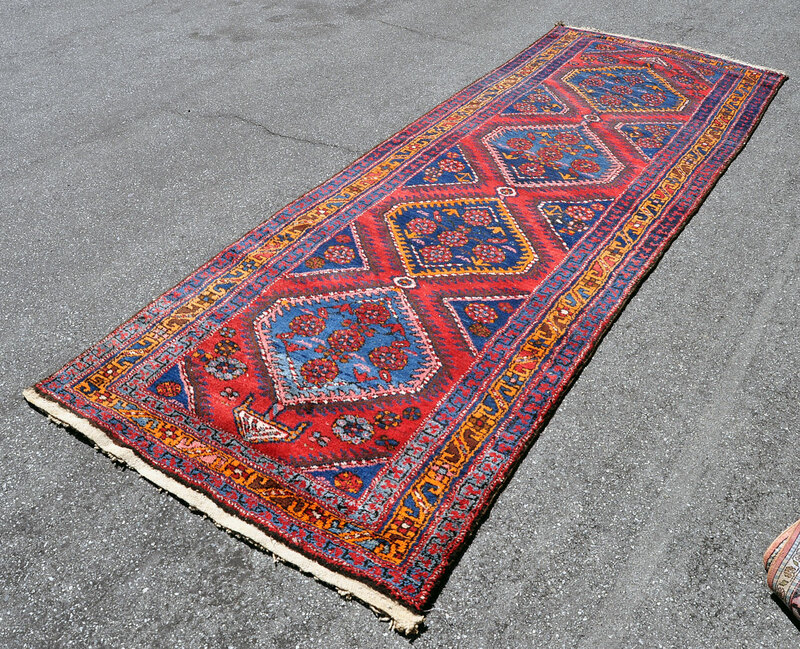 Based on dyes and weave, this is a Persian village Bakhtiari or possibly Luri rug. The motif is not a common one for the Bakhtiari as they tend to weave Heriz style medallion or floral garden type rugs for the most part. This would be a more common design around Shiraz and the Qashqai weavers of the Zagros Mountains. Condition is generally very good with some minor wear on the pile. No repairs, weak spots, or odors. Short natural wool pile woven onto cotton warp. 1960s. Rug could be used in a high foot traffic area of your home or office. Out of my personal collection. Size is 9 ft. 1 in. by 4 ft. 6 in. Mind boggling cosmic space alien art for your floor! Price is $599. Shipping is $43. Or free local pickup. Most of the Shahsavan tribe lives in northwest Iran near the city of Ardabil and Dashteh Moghan. However, dispersed groups of Shahsavan also live in central Iran near Saveh, Karmsar, and Varamin. In Farsi, Shahsavan means “those who love the Shah”. This was a 17th century title bestowed on warriors from these tribes for their loyalty and diligence in defending the northern borders of Persia. As well as beautiful geometric carpets, the Shahsavan weavers produce many functional pieces such as saddle bags, mafrash bags, and animal covers. 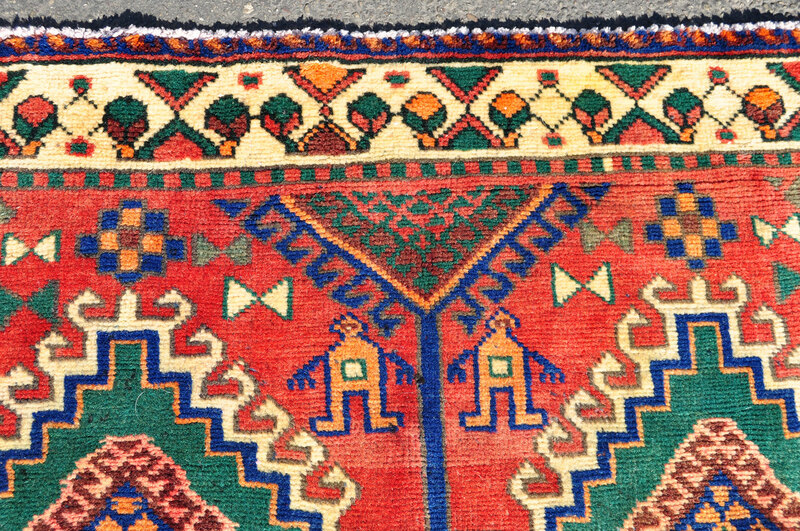 These textiles are often woven in the kilim and soumak style. This stunning Shahsavan geometric carpet was probably woven near Saveh, which is about 80 kilometers south of Tehran. The color palette and design elements share much in common with Shahsavan rugs from the more northern regions around Ardabil. Wool pile woven onto cotton warp. Some very minor wear. Soft and harmonious colors including salmon, ivory, blue and green. A large and impressive room size tribal textile. Exact size is 10 ft. 6 in. by 6 ft. 7 in. Price is $775. Shipping is $55 or free pickup is an option in this area. Please email me if you have questions. Thank you. Wonderful condition with no signs of wear. Dramatic royal hand to hand combat between lion and king. Pairs of male and female lions in each corner. The female lions (similar to white domestic cats) appear to be under attack by the male lions– echoing the center struggle. Fantastic abrash (color variegation from different dye batches) in the red field . Various birds and icons float around the center combat like mesmerized spectators. 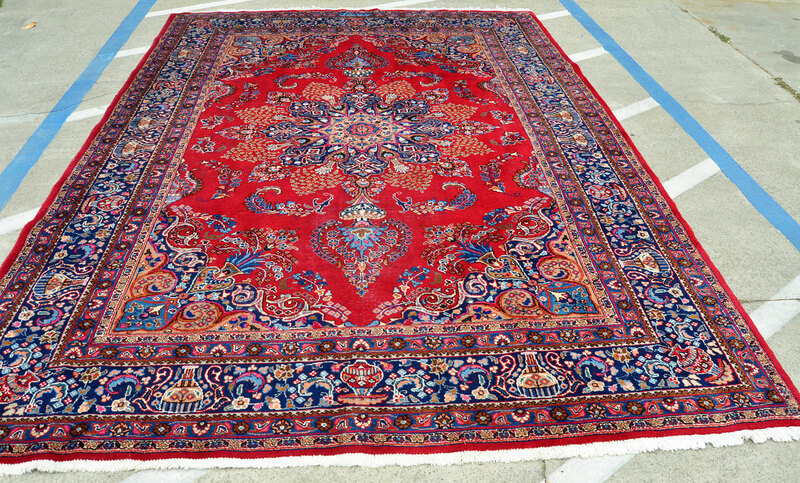 This rug displays one of the most dramatic pictorial rug designs that you will encounter. Woven by the Qashqai in southwest Iran. 1970s. 100% wool. Impressive size at 8 ft, 2 in. by 5 ft. 4 in. 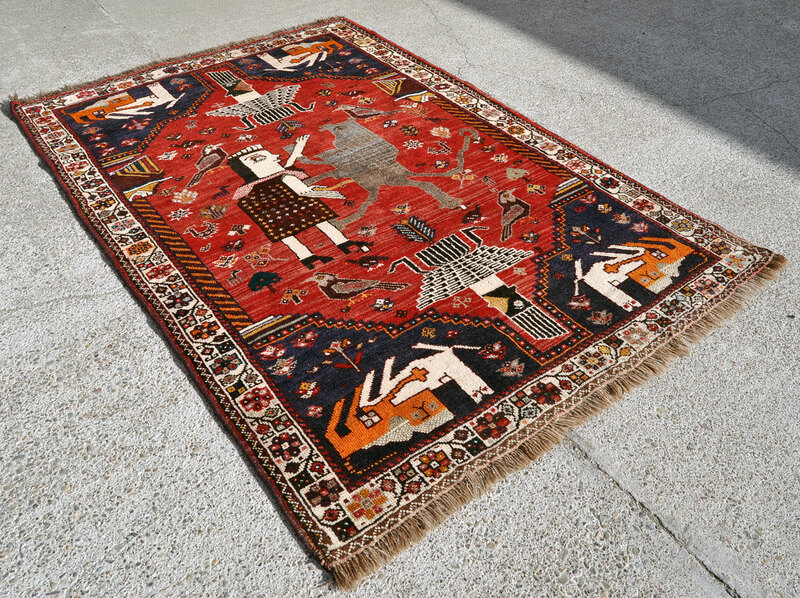 Most of the Qashqai tribal rugs woven with this design are considerably smaller. Price is $849. Shipping will be $38 in continental U.S. Free pickup is an option.